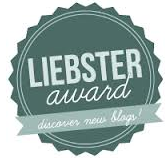 While LaughingMom.com generally features posts with a humorous angle, I occasionally write posts which fall under the category “No Laughing Matter”. I have never met Sage Morin, her husband, George, or either of her sons. For strangers, we have a lot in common. We live relatively close to one another. We each have two boys who are the same age. I suspect we frequent the same play places, parks and family restaurants. Today, Sage and George are burying their 2 year old, Geo Monseuf. In the past week, I wept for this family of strangers as if they were members of my own family. While I am one of over 17000 members of the Facebook page Justice for Geo, I don’t feel comfortable posting condolences on a Facebook wall. Instead, I hope a blog post can draw attention to the Justice for Geo cause, as well as gain further support for his family. I cannot imagine the journey of heartache that is just beginning for them. Last Sunday, 2 year old Geo, son of Sage and George, spent the day playing with his family. I understand he was excited to have used the potty for the first time and the family headed out for dinner to celebrate. On the patio of a local restaurant, the family ordered drinks. They are all of us who have done the same dozens of times. They were there about 15 minutes when (The Calgary Sun reports), “a blue Acura SUV was pulling into a stall in front of the restaurant and ‘for reasons unknown,’ accelerated and mounted the curb.” The SUV plowed through the family, injuring the father and one year old son. 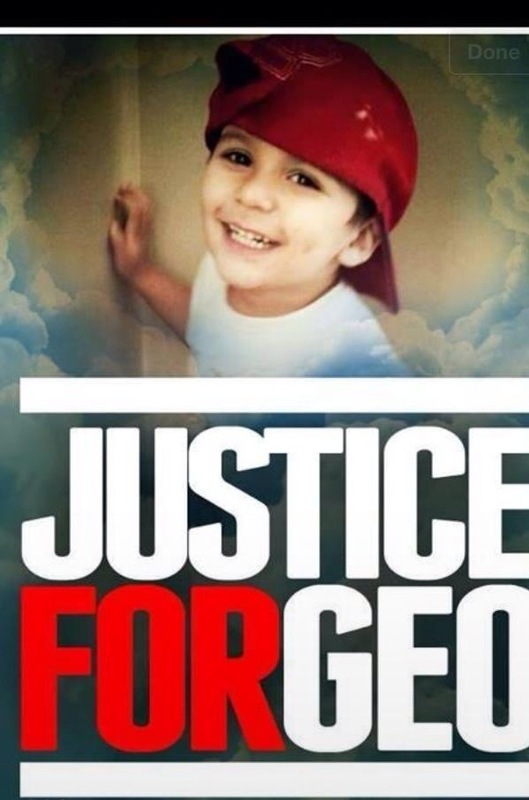 Two year old Geo was killed. Facebook accounts report that the driver stumbled out of his vehicle, too drunk to stand. The Edmonton Sun reports that 62 year old Richard Suter is charged with impaired driving causing death, two counts of impaired driving causing bodily harm and refusing to provide a breath sample. Police believe Suter had been having an argument with his spouse when he got into his SUV parked in front of the patio where Geo’s family was eating. Instead of putting the SUV into reverse, he put it in drive, climbing over the curb, driving through the railing and pinning the toddler against a wall. Mr. Suter was later released on $1000 bail. He appeared at his hearing via closed circuit television. 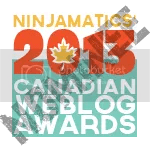 Geo’s mom, Sage Morin, soon started the Justice for Geo Facebook page (presently with over 17000 members). While suffering the heartache of the loss of her child, she is determined the accused , and all those who (unfortunately will) come after him, will receive stricter penalties. She is a force to be reckoned with. In the past week there have been rallies, ribbons, petitions and protests. I read some of the posts on the Facebook page. With anguish, I read posts of support from other people who are suffering the loss caused by an impaired driver: parents who have lost a child, a woman who miscarried at 7 months due to the complications from an earlier accident where she was hit by a drunk driver, an aunt whose 5 month old niece was killed, a woman whose sister was killed, support groups with hundreds of members who had been through the same thing, other justice pages…. It shouldn’t have to be written that this horrific, sickening tragedy is preventable. Cabs, car services that you drive you home in your own car, parents, children, friends, coworkers, the bus… Losing a child has to be one of the most difficult things a parent might ever be faced with, yet, the senselessness of being a victim of an impaired driver make it so much more horrendous. I don’t know Mr. Suter. There is little in the news about him. I understand he is a husband and a father. He is a grandfather. He will have his day in court. Justice for Geo supporters intend for it not to be an easy one. I don’t know why he did what he did, but I suspect his actions will take its toll on his family as well. I don’t know Sage Morin. I am in absolute awe of her spirit. I hope the 17000 strong supporting her and her family provides some comfort. I take solace that even in tragedy, Sage is being the best mom to Geo that she can be – fighting for justice for her child. She has my support. 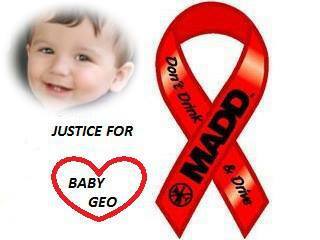 Justice for Geo. ← Convos with my 2-year Old. I am so impressed with Sage Morin and how strong and determined she is. She’s heartbroken but determined to make a difference. I hope her beautiful son gets the justice he deserves. Drunk driving is horrible and almost always leaves behind innocent victims! Our state, courtesy of a few really heinous acts by life long drunk drivers have recently enacted some harsher penalties. How we will pay for it, who knows? But Id willingly donate! A devastating story that is unimaginable to me. My heart goes out to them. Hate Letter Sent to Mother of Autistic Child. Submit your stories for Make Me Laugh. Submit a photo or story to be featured in Friday's Make Me Laugh column.